Norwegian cookbook author and television host Andreas Viestad is on a mission to help Norway’s famed Hurtigruten cruise-and-shipping line reshape its food. Here, Tom Downey checks in. On a four-night trip from Bergen to Tromsø, I got to see what he’s been up to. The Hurtigruten line is unique: Not only do travelers sail on its ships, but the company is also a vital cargo link for people living in hard-to-reach locations within the many vast fjords. Viestad’s menus allow travelers to connect the food with the scenery. My journey began with a Bergen specialty: a creamy sweet-and-sour fish soup filled with root vegetables. Throughout the route, the menu mirrored the passing coast, shifting from smoked rainbow trout to field-raised lamb, and finally to the codfish that has been one of Norway’s exports for centuries. As the ship made its way through the narrow fjords, everyone scrambled to the top deck to see the coastline up close, ignoring the semi-Arctic wind. Gliding past isolated farms perched on the mountainsides, I got a clearer sense of what Viestad meant when he spoke about the remote, rural origins of Norwegians—and of the ingredients and techniques so central to the past and the future of this country’s cuisine. 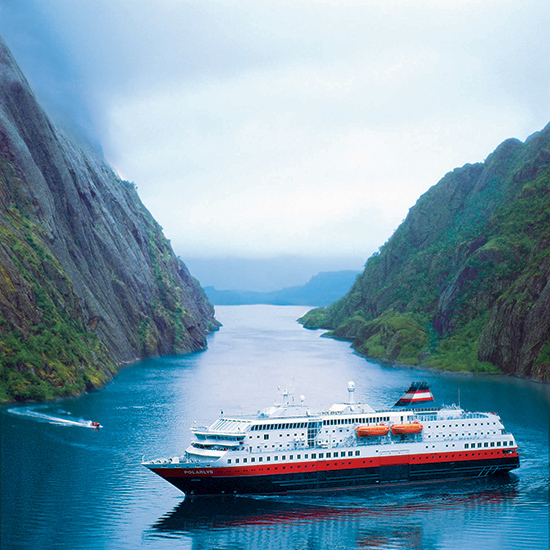 Six- to 12-day cruises starting at $1,319 per person; hurtigruten.com.